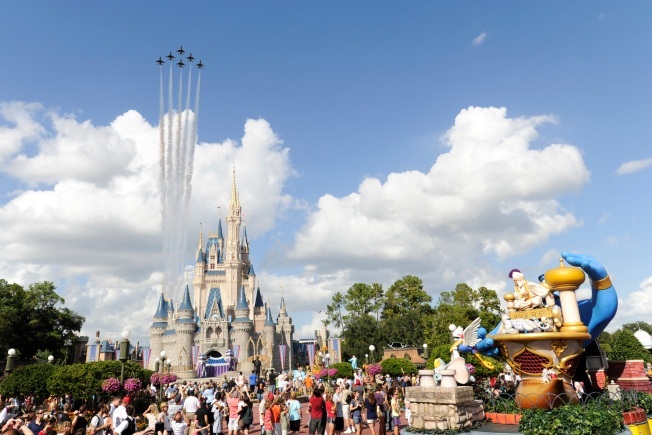 In this publicity image released by Disney, the U.S. Air Force Thunderbirds fly over the Magic Kingdom on Tuesday, Oct. 26, 2010, in Lake Buena Vista, Fla. In one video, a little boy dances during a parade at Disney’s Magic Kingdom. In another, a young girl dressed as a princess embraces her father. And in a third, two women explore Cinderella Castle. All are part of Disney’s new campaign called “Let the Memories Begin” — a promotion that relies on what the company refers to as “guest-generated” content. Disney isn’t alone. The travel industry — which for years considered videos as byproducts of a happy vacation, if not liabilities that occasionally found their way on to the Internet — has also had a change of heart. User-generated videos aren’t exactly new. They’ve been popular for years and have big audience online. According to ComScore, 178 million U.S. Internet users watched online video content in August, the latest month available. That’s an average of 14.3 hours per viewer. Many of the clips online are produced on the cheap, using a cell phone and rudimentary editing software on a PC. But Disney’s campaign marks a turning point. The grainy videos with the tinny sound that occasionally went viral are now being accepted and even celebrated as authentic representations of a vacation experience. Travel companies could get a boost from that trend, in terms of improved sales and visibility. But travelers might be the real beneficiaries, in the long run, because they’ll gain power. But letting the user-generated content genie out of the bottle could also backfire. While Disney’s experiment is carefully orchestrated, other initiatives haven’t gone as smoothly. An often-cited case is TripAdvisor, which is best known for its written user-generated hotel reviews. Hoteliers have long complained that the reviews are false or inaccurate, and now several hundred have reportedly banded together and are considering filing a defamation suit against the company. “The pitfalls are the same,” said Kaleel Sakakeeny, the chief executive of New Media Travel. The content, he added, reflects the experience of the traveler and not necessarily the interest of the company or destination in the video. For example, a customer with a video camera in the wrong place at the wrong time could easily create a clip that negates all of the positive effects of a hundred user-generated videos. And since video can be more influential than a written review or a posted photo, the risks are greater. Industry-watchers warn that encouraging users to document their vacations with their video cameras and post them online may, in fact, lead to more headaches than heartwarming moments. Social media professionals say the move toward user-generated video content doesn’t mean the professionals should pack it up and go home. But Andy Newman, whose public relations firm represents the Florida Keys and who has been an early adopter of video to promote travel, said viewers still prefer to watch professionally shot and edited footage. For example, the Keys runs a weekly video on its website on subjects ranging from how to make key lime pie to a tour of Dry Tortugas National Park. Many of these productions have tens of thousands of views. “There’s still a place for good, news-style video production,” he said. Still, Disney’s acceptance of user-generated content is an important milestone in the evolution of online video. It shifts some power to travelers — power that they never imaged they’d have. And there’s more to come.